Last weekend, we noted evidence of those changes. This week, the markets were given the clearest sign yet that the Fed, and Central Banks globally, were all too ready to come to the markets rescue. But yet, these “emergency measures” are STILL in place. Eurozone banks, global economies, and markets are still needing massive levels of support to stay afloat. Yes, Kudlow is certainly “spinning the yarn” for the media to try and keep markets complacent. However, the Fed is clearly signaling their concern about “reality,” which as the data through the end of December shows, the U.S. economy is beginning to slow. The question you should be asking is what do they know that you don’t. Use code “Bear Market” for a 1-MONTH free trial to RIA PRO. You get access to our exclusive commentary, portfolios, and a ton of research data to help improve your investing. From a technical short-term perspective, the recent bullish market action remains confined to a “bearish” trend currently. This keeps the risk/reward ratio unbalanced for aggressive equity exposure. As shown, this past week, the market tested both its previous support of the October and November lows while maintaining above the 50-dma. However, despite the news on Friday which pushed prices sharply higher, the market failed to break above it previous highs and still remains trapped below the downtrend line from the 2018 highs. We are still a long way away from that happening. 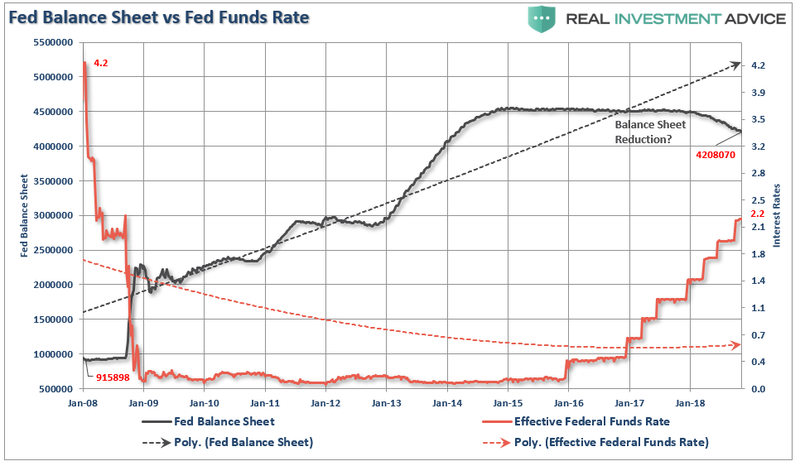 The rally on Friday was based on the Fed will turn exceedingly “dovish” in their meeting next week. This could well wind up disappointing the markets. Last week, we added equity exposure to our portfolios with the acquisition of some companies that we like the fundamentals of. However, we also swept a large portion of our trading cash into 1-3 month Treasury bills as the risk/reward for equities remains negative. The Dow Theory is still flashing a “sell” signal. Before this indicator can turn bullish again, the rally that has taken the Dow Jones Industrial Average almost straight up since its Dec. 24 low must end. That’s why bullishly predisposed Dow Theorists should be hoping for a market pullback. 1. Both the Dow Jones Industrial Average and the Dow Jones Transportation Average must undergo a “significant” rally after hitting new lows — “significant” both in terms of time and magnitude. This step has been satisfied by the market’s rally from the Dec. 24 lows. 2. Both of these Dow averages must subsequently undergo a “significant” correction of the rally referred to in step #1, and in this correction either one or both of these Dow averages must hold above their previous lows (Dec. 24). We are waiting for this step. 3. Both averages must rise then rise above their highs registered at the top of the rally referred to in step #1. One of the lesser-appreciated aspects of this three-step process is that, without a “significant” pullback (step #2), a buy signal will never occur. Over the last couple of weeks, we have watch a sharp rally in stocks as Washington, The Fed, and Global Central banks have put their best foot forward to provide a “put” underneath stock prices following the rout last year. That continued to be the case this past week, but now the rally is pushing into exhaustion territory. We continue to recommend taking some action in plans if you haven’t done so already. We are going to get a correction, the only question is the timing of it.